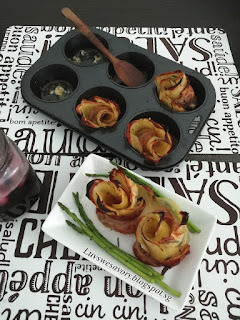 When I saw Potato roses (tasty.com) this video, it reminded me on the rose shape of some buns or tarts that I had made few years ago. But these loaded with carbs yet sinfully tasty savoury bites definitely are my big kids' favourite to serve as main or sides. About 1 tablespoon olive oil to grease the muffin cup. Lightly grease the muffin cup with olive oil, set aside. Preheat the oven to 200°C. Position the rack in the center of the oven. *Note : The temperature of the oven may vary, do adjust accordingly. Peel potatoes and slice them using a mandoline or vegetable slicer. In a big bowl, combine potato slices, olive oil, black pepper, rosemary and salt. Stir and toss well to coat the potato slices. Place 1 strip of bacon on a big plate or clean cutting board. Arrange the potato slices along one edge so they are slightly overlapping (about 15 - 20 potato slices) *note: use 2 strips of bacon and more potato slices for a bigger rose. Sprinkle evenly about 1 tablespoon parmesan cheese onto the potatoes. 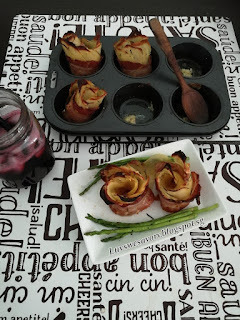 Roll up the bacon and potatoes to form a rose shape and put it in the cup of a muffin pan. Repeat the process. Cover the muffin pan with aluminium foil and bake for 60 minutes. Remove the foil in the last 10 mins and continue to bake until the potatoes are cooked through and the edges are brown and crispy. Transfer the potatoes to a serving platter, serve immediately. 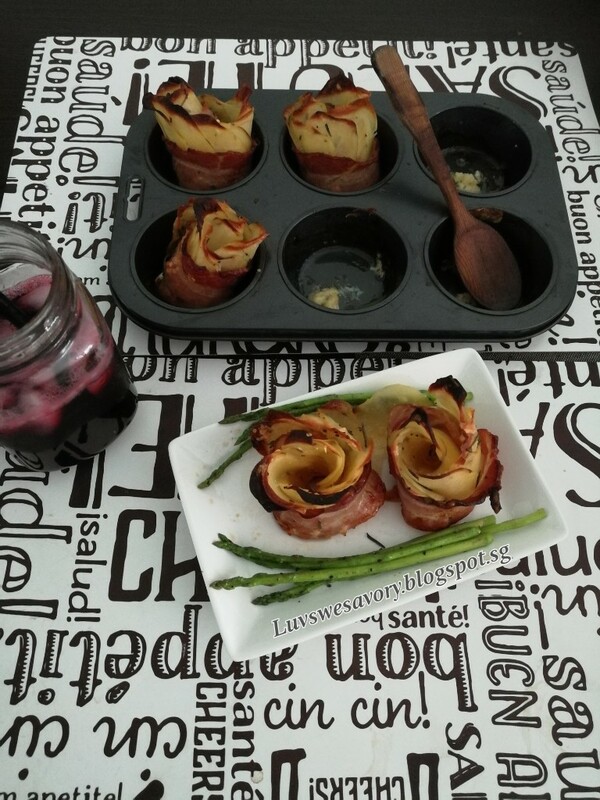 Enjoy these tasty bacon wrapped potato as main or sides with some greens. What a fun, pretty and delicious potato side dish! I know my kids would love these too! Wow! I would love to have some now! I am sure I would enjoy eating those potato side dish!